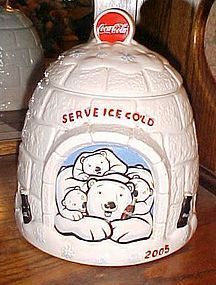 Coca Cola Polar Bear Igloo Cookie Jar Coke 2005 Holiday Winter 9 1/2" x 7 3/4". No chips, cracks or crazing. Just scuff marks as seen on bottom of unglued base. Typical for cookie jars. Near Mint Condition.